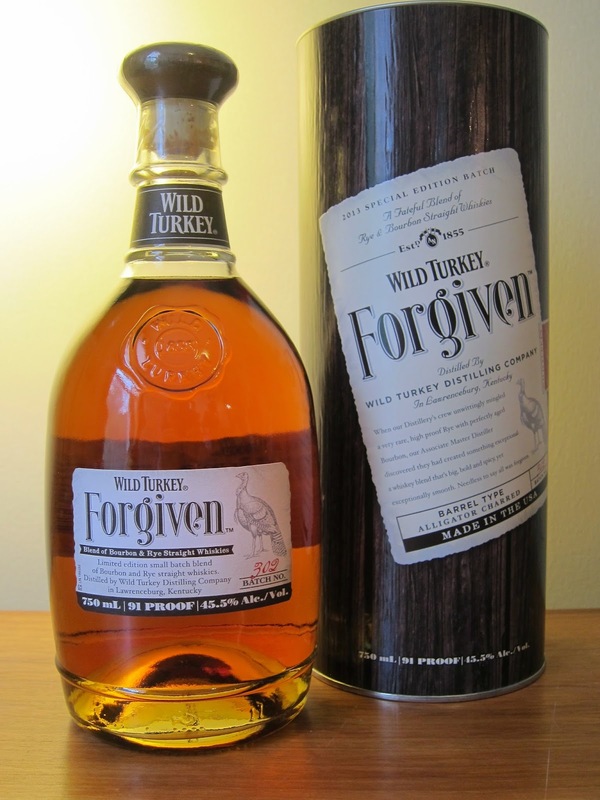 Wild Turkey Forgiven Batch #1 (45.5%): Everybody loves a good story behind a dram and Forgiven has a great one for sure. This particular story starts at the day when the distillery crew accidentally vatted a very rare, high proof rye with perfectly aged bourbon. They realized immediately what they did, let the management know what happened and started to pack their things feeling certain that they will be shown the door. But when Eddie Russell showed up and tasted the blend he thought that they had something special there. He decided to bottle the blend as a special expression right away and needless to say the staff was "forgiven". I don't care too much if the story is real or not. All I know it is a very very good one.. The vat contains 22% four year old rye whiskey and 78% six year old bourbon. As a matter of fact the product has been so successful the distillery decided to release a second batch this year. What I have in my sample bottle is the 1st release from last year though. Color: Polished copper pot, clear clover honey Nose: Salted caramel, cinnamon and nutmeg. A very approachable and inviting nose. It gets better and better after allowing the spirit air for a couple of minutes. Very dense German rye bread, zante currants and high quality maple syrup. Adding a few drops of water amplifies the rye character: Ground cloves and garam masala. Palate: Spicier than the nose suggested: coarse ground black pepper, fresh ginger and cayenne pepper. Dominantly rye notes. Charcoal and pumpkin spice mix. Adding water thins the texture a lot but made it incredibly smoother and dangerously easy to drink. The mouthfeel is now more like a satin cloth rather than a thick velvet... Finish: Long fade with peppery notes and cinnamon syrup. Overall: It is a great product. I have to admit that I didn't taste anything that I didn't like from Wild Turkey for a long long time. I think American distilleries should do more experiments like this. I am glad that High West started this trend. I know that the industry doesn't feel safe about releasing products that they cannot label as solid as a bourbon, rye whiskey or anything else which has been familiar to the consumers for a long period of time but I think it's the best time to take these kind of risks nowadays especially when people are buying whiskey like there's no tomorrow. It would be great to have a market like Scottish blended malts or blended whiskies. Kudos to Wild Turkey for being one of the first non-craft distilleries to take the risk.